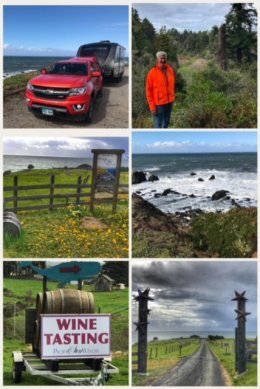 This leg of the trip took us up Highway 1 from the Sonoma Coast to the Mendocino Coast. 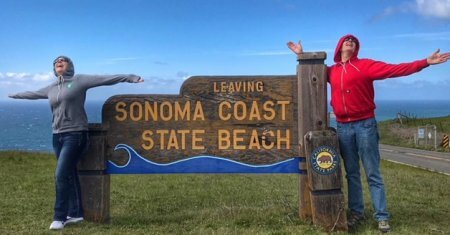 We hunkered down in Fort Bragg — and we mean hunkered down because while this stop was bookended with sunny weather, the middle was filled with a lot of rain from an atmospheric river that seemed to settle over the north coast. Our first day resulted in a wonderful sunset walk along an old logging railroad and trucking road, including a hike over the historic trestle above Pudding Creek (built in 1915 for a train line and converted to a one-lane logging haul bridge in 1949, before being transformed to a pedestrian bridge in 2007) — all part of the Union Lumber Company’s Ten Mile Branch that carried redwood logs down to a mill in Fort Bragg. You’ll find the path and bridge (officially named the Wesley Chesbro Pudding Creek Trestle) on the north side of town in MacKerricher State Park (which also includes Glass Beach). We also got to experience fields of various wildflowers and Calla Lilies. It was truly one of those perfect evenings. 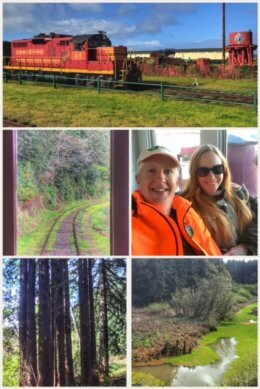 We lucked out the next day with a trip on the “world famous” Skunk Train before the rain came back. We rode the Pudding Creek Express, a one-hour, 7-mile ride in a vintage passenger railcar along the Pudding Creek Estuary along the old California Western Railway line. The ride includes excellent narration of local history and culture… and even gave us a tip about a little park in town that protected a grove of old redwoods. The nickname Skunk dates back to the 1920s when single motorcars (also referred to as railbuses and railcrusiers) were used on the line; these cars had gas-powered engines and crude-oil-burning pot-bellied stoves to keep passengers warm — with the combination of the two fumes creating a very pungent odor, which folks along the line said smelled like skunk. Folks said “you could smell ’em before you could see ’em.” Besides the Pudding Express, the Skunk Train offers several other train rides. Thanks to our conductor on the Skunk Train, we took his tip and headed to Otis R. Johnson Wilderness Park, also in Fort Bragg, at the east end of Laurel Street — because no one can ever see enough redwoods! This 7-acre park offers fun hiking trails through a redwood forest with two creeks (Duck Pond and Cedar) ending with a scenic overlook above Pudding Creek. We had a bit of envy for the houses that backed up onto this park. Imagine knowing that whenever you looked out your back window you would see giant redwoods? What’s a stop in Mendocino County without a little wine tasting at some of the almost 100 wineries? We had planned to do more of it, especially along Highway 128 in the Anderson Valley (as well as the Redwood Corridor along Highway 101), but the crazy rains forced our hand — and kept us safely snug in our cozy camper. By the way, for those avoiding the crowds in Napa, Mendocino Wine Country is only about 90 miles from San Francisco. We did get out one afternoon and visited Pacific Star Winery, located right on Highway 1, about 12 miles north of Fort Bragg. The owner is a delightful woman (though a bit of a know-it-all), but the thing we loved about her winery is that she uses rare grape varieties and creates signature blends with them. We left with a bottle of a red blend called It’s My Fault (a blend of Dolcetto, Negroamaro, Barbera, and Charbono) and a bottle of 2014 Brunello. Perhaps the best part of the winery is the location — and the amazing views of the Pacific Ocean and rocky Northern California coast. 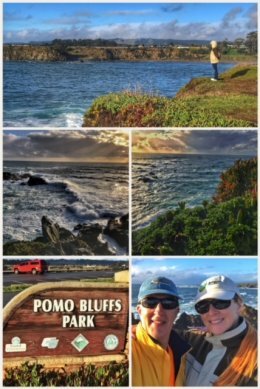 We capped off our visit with another (lucky) sunset hike along the Pomo Bluffs at the city park of the same name. 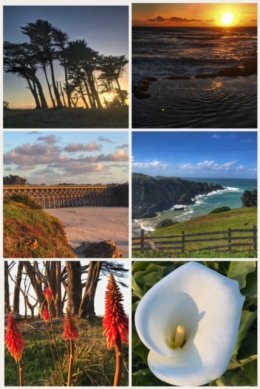 The 25-acre park located on Cliff Way (off of Ocean View Drive), has sweeping views of the Pacific Ocean and Noyo Bay, and offers a delightful hiking trail with numerous interpretative signs (as well as bathrooms at the trailhead/parking area). The park is also a great place to spot whales during the gray whale migration — and we were lucky enough to see one off in the distance, as well as two silly geese who insisted on chilling on the edge of one of the bluffs. 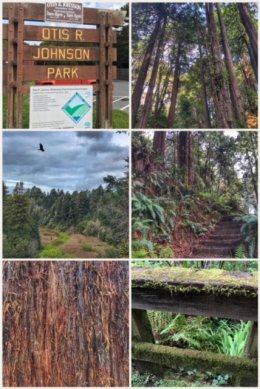 We knew we loved Fort Bragg, but one of the signs at Pomo Bluffs Park explained it: “In Fort Bragg, settlers were from Finland, Sweden, Norway…” all coming for work in the late 1800s because of the bustling logging and lumber work — including that of redwoods, pines, fir, and tanoak. Mendocino touts itself as having spectacular scenery (including unspoiled beaches, verdant hills, and secluded lakes), a sense of isolation and discovery, and an escape from the everyday grind out of the outside world… and we can honestly say that the marketing hype lived up to our experiences.